Angela Merkel, Germany’s chancellor, in Frankfurter Allegemeine newspaper laid out ideas for more European integration, including the creation of a joint refugee agency that would determine asylum requests on the continent’s borders. “In a changing global order, Europe must be able to act, internally and externally, to be taken seriously by the world”, said. Merkel, frightened by the recently far-right election results, seem stretch out a hand to Italy and Europe’s beleaguered from immigration. However, it is necessary to get a better understanding of the migrations from Africa to south Europe. About one-third of all the refugees around the world originate from Africa. Africa has experienced and suffered several wars. In Africa, eight countries have experienced conflicts in the past five years. These countries are Ivoire Cost, the Central African Republic, Libya, Mali, Nigeria, the Democratic Republic of Congo, South Sudan and Burundi. An estimated 53% of all African refugees are children, that is nearly one million of young people. The largest refugee populations of the world are located in Africa: Ethiopia, Kenya, and Uganda. Seven out of the top ten countries with the most national resources that also have the highest number of refugees are African and these are led by Democratic Republic of Congo, Ethiopia, and Uganda. This phenomenon today is amplified and made inevitable by ongoing humanitarian crises. People are trying to escape persecution rising from different race, religion, nationality, innovative membership or political opinion. The roots of these topics need to be deeper investigated. To escape poverty is the main goal but also to escape conflict or violence. Many are also displaced by the jihadist groups operating, as al-Qaeda in Maghreb and Boko Haram in northern Nigeria. The phenomenons of migrations are also due to environmental factors connected to climate changes: natural disasters, erosion, floods, hurricanes, tsunami. It has been estimated that almost one million people will be displaced in the next 50 years because of the effects of climate change. Some of them are also seeking for superior healthcare. Imagine living in a country with limited access to healthcare when you are suffering from serious health problems. Not least consider that parents always whish to offer more opportunities to their children. Parents sometimes make the difficult decision to migrate so their children can benefit from things like a superior education, and better job opportunities. Niger is the main hub on the route to North Africa. The majority of incidents occurred along routes from western Africa and the Horn of Africa towards Libya and Egypt. Sickness or violence are the main causes of death in those cases. However from Niger northward, migrants are illegal and are so forced to relay on smugglers and traffickers to reach Libya and Algeria. The majority of migrants in Libya are compelled to live clandestinely under the cover of smugglers or kidnapping organisations. People from those countries are daily exposed to kidnap for ransomed, forced labour, sexual violence and enforced prostitution. After drugs, weapons and prostitution, immigrants are the fourth most profitable business in the area . After restrictions on the European eastern route, about 82% of all migrants are travelling to Italy from Libya by the central Mediterranean route. The other people move from Turkey bound to Greece or, more recently, from Morocco bound to Spain. 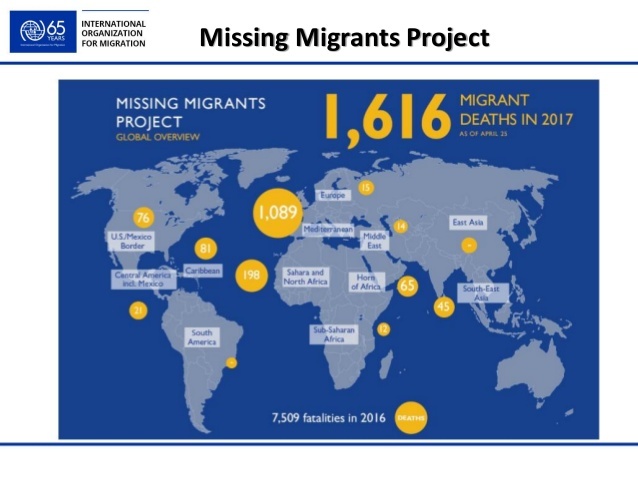 More than 22,500 migrants have reportedly died or disappeared globally since 2014. 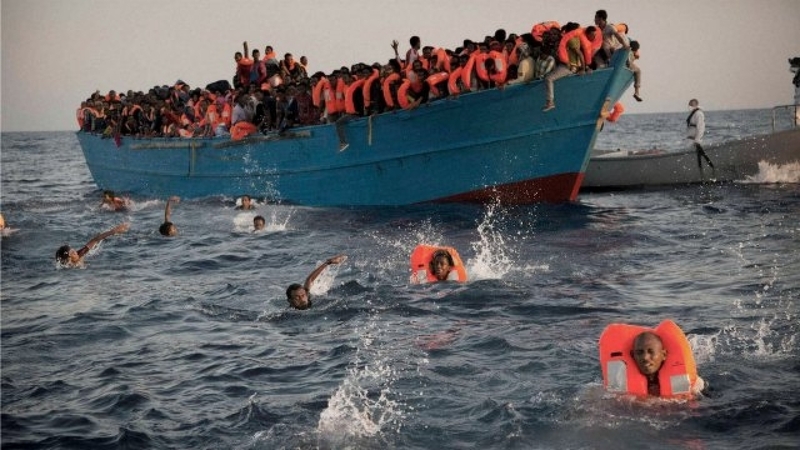 According to a study by the International Organisation for Migration (IOM), more than half of them do perish while attempting to cross the Mediterranean sea. The massive inflow of refugees that the European Union had in 2015/2016 took many countries by surprise. As a consequence of their geographical position and the Dublin Regulation, Italy, Greece, and, to a lesser extent, Spain have been most affected. However Countries such as Austria, Sweden and Germany, took in the highest numbers of migrants compared to their population. The growth in the number of arrivals has created the perception of a crisis. So the issue of migration has had great influence on elections in Austria, France, Germany, Italy, and other European countries, boosting support for populist and eurosceptic parties. Nowadays Italy is hostage of this situation and fails to have a government. To cope with all this the European Union migratory policy should be able to develope significant strategies: being both able to collaborating and working with origin and transit countries and strengthening the external borders of European Union. Moreover one of the key priorities of the migration policy is the prevention of illegal migration. It is mandatory that irregular migrants have to return to their countries of origin, but the most important thing is that we need to foster the integration of third-country nationals. Today the word refugee is used to refer to all people entitled to protection. Residence permits of asylum are rarely given to refugees. Instead temporary residence permits on grounds of subsidiary protection or humanitarian protection are more easily granted . These type of permits only last three years and give less rights. In the past few years in Italy only 1 request of asylum out of 10 ended up with the status of refugee. At the same time the number of requests for subsidiary or humanitarian protection which get approval are significantly increased. It can be estimated that about the 59% of the people, arriving to Italy across the Mediterranean sea, ask the status of refugee or international or humanitarian protection in Italy. However the majority of them prefer to address their request protection to other European countries. Following the asylum application, the immigrants are welcomed in centers called “first reception” and await for a response. The illegal immigrant, who has not applied or has been refused, is taken to special centers called “identification and expulsion centers” to be sent home as soon as possible. Illegal Asylum seekers caught in a third country of the European Union have to be sent back to the first European country where they first arrived in order to make their asylum claim ( in accordance to Dublin regulation ). The European Union has a specific role in trying to work out which country is responsible for handling an asylum request. The Eurodac system helps identifying which country was the entry point by a database of fingerprints. However, the Dublin system creates a fundamental inequality by placing too much responsibility on frontline states like Greece and Italy. Italy and Greece are constantly struggling with pressures of the financial and political crisis and a large increase in north-African migrants.